When I moved back to eastern North Carolina after years in Florida and then Boston, I was happily reunited with barbecue made the right way — slow cooked over wood and seasoned with vinegar, not, I repeat not, with tomato-based sauce. This Wilber's waitress is a winner! We all have our favorite BBQ joints, and Wilber’s is mine. I was thrilled to bring Wessel here. Somehow Wilber’s had stuck in my brain, although I moved from North Carolina at the tender age of 16, when I didn’t care what I ate as long as it had pasta and spaghetti sauce in it. We most recently stopped at Wilber’s on Memorial Day, on our way back from the beach. It was just us and about 80,000 other customers doing the same thing. We got ‘cue to go, along with coleslaw, sweet tea, and hush puppies. Classic Wilber’s. The restaurant is totally old-fashioned, with as many locals as visitors. 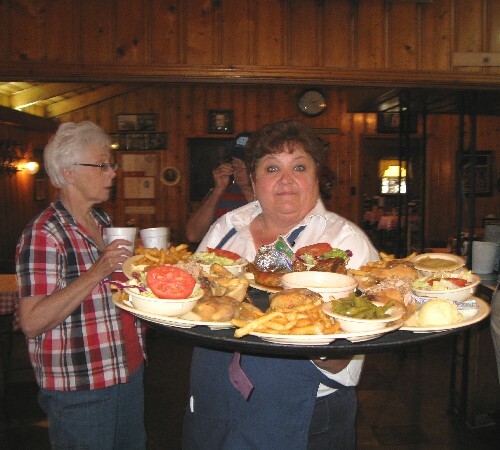 There’s always a brisk takeout business, but the table service here is great too — friendly and oh so country. Yanks might need a translator. Wilber’s also has great Brunswick stew, fried chicken, and other Southern specialities (pronounced spesh-ee-AL-i-ties). We love sending our friends there, too, like the Dutchies, at left, visiting from the Netherlands last summer. They loved it, maybe even a little too much. The word has been out on Wilber’s for a while now. As owner Wilber Shirley said in an interview with John Shelton Reed and Dale Volberg Reed of the awesome book “Holy Smoke: The Big Book of North Carolina Barbecue,” “we’ve been written up in right many magazines over the years.” (That’s an understatement.) All deserved, too! I do have to say that after spending this past weekend at Fickle Creek Farm in Efland, North Carolina, which raises its hogs sustainably and environmentally, I am feeling a tad guilty about hawking a place that I’m guessing doesn’t really think right much about that stuff. But there you go. My blinders are firmly in place, and I’m here to say: Willllll-berrrrrs! Willll-berrrrs! This entry was posted on June 2, 2009 at 8:03 am and is filed under Food, North Carolina. You can follow any responses to this entry through the RSS 2.0 feed. You can leave a response, or trackback from your own site. Okay, those before and after photos are hilarious! The waitress on there thats a winner…is a fabulous person. She will do your right. I love her. Her name is Suzanne. The sweetiest person in Wayne County. I really miss good Carolina BBQ….Its sooo cold here today(Austin, TX) and I am really in the mood for Wilber’s awesome pig sandwhich and Brunswick stew, Wilbers is always the first stop when I get off of the Plane in Raleigh and head to my home town in Kinston. I hope you’ve also checked out Chef & the Farmer downtown Kinston. Way different, but way yummy. YOUR RIGHT this is the best bbq. we have a place in my hometown of smyrna ga that has great bbq and has been in business and family owned for many many years (Old South BBQ) but they cant touch WILBURS we would stop by on our way to morehead city (my moms hometown) and I could never get enough and we would always bring home some of the sauce toooooo goood love this place. I used to work at Wilburs when I was in highschool! It was a GREAT place to work and I totally miss those years. I now reside in VA and don’t visit home (Goldsboro) but only a few times a year but there is NO question that good old NC barbecue (and ONLY Wilburs of course) will be had! Its funny its been eleven years and whenever I go in with my children and family there are old faces and new faces that greet me and they still treat me with the same love I had working there. I tell people in VA you guys dont know barbecue until you have had Wilburs! That’s terrific, Ashley. Thanks for sharing your story! We used to stop at Wilbers every friday evening on our way from Cary to Oriental. This was 15 or so years ago. Have since moved to VA, and don’t do that trip anymore, however, we went to Oriental two weeks ago and stopped at Wilbers on the way home. It was still the best!!!!! Even took some BBQ home to put in the freezer! (freezes very well, by the way!) Service was great, as always, can’t wait to come back! You’re right, it does freeze well. Highly recommended! The worst/best part is driving home with the smells wafting through the car. Torture! Wilburs has been a long-time family favorite, I was first introduced as a child in the late ’60’s. I grew up and currently live in the Washington Metropolitan area yet, still hold this restaurant near and dear to my heart. Our family has shared many family-style meals at Wilburs. It’s a wonderful place, not because of the food alone, but also because of the staff, it’s truly an experience. It’s very difficult to find places in this area that know what and how to make real NORTH CAROLINA Barbecue, Hush Puppies, Cole Slaw, Barbecue Chicken and Brunswick Stew. I can’t wait to get back to share a meal with my children. Thanks for the wonderful memories!!! Thanks for sharing! I feel the same way. Was just out that way and we picked up some ‘cue. Though during one stop they’d run out by late afternoon on a Sunday. We were so sad! We were stationed at Goldsboro in the late 60’s to early 70’s. As a child my parents used to take us to Wibers to eat. Loved the place. Still have fond memories of the food there. I miss it and have lived all over the world and most states and still think this is one of the best food ever. I do miss it and decided to check online and found the website. I will have to order some sauce but do wish could get the smoked Que itself ordered online. That would be the best. Would love to order about 50 LBS for a get together and to freeze for special guests. What a nice note! You absolutely need to order those 50 pounds to share with friends! We always get extra and freeze it and it still tastes yummy! My father was stationed at nearby Seymour Johnson AFB when I was 10 or 11 and we lived just outside Goldsboro until I was 14 when we moved to Germany. I Loved going to Wilber’s after church on Sunday. I missed that place since we moved, and have never forgotten the incredible BBQ. Recently I was lucky enough to be transferred to Smithfield and am itching to get down to Goldsboro TODAY to re-kindle my love affair with Wilber’s! Yay! Not only will you not be disappointed, I think you’ll find that not all that much has changed, and when can you say that these dasy? I first had Wilbur’s BBQ way back in 1979 and have been a fan ever since. Right now I am in Melbourne Florida and I went to Woody’s Barbecue had a great smoky pulled pork sandwich for dinner tonight. Although on the menu it was billed as North Carolina Pulled Pork Sandwich, it wasn’t even close. Wilbur’s sets the standard the rest of the world tries to live up to. Happy anniversary! I just learned that Wilber’s Barbecue is celebrating its 50th anniversary today. Thanks for pointing that out and providing the link to that story — great article. Everyone should read it!